The first day of school seems to be getting earlier and earlier. We never stared until after Labor Day. Some kids have already returned to school and many will start in the next week or so. It is a shame because summers during my childhood seemed to last forever and were filled with many adventures! 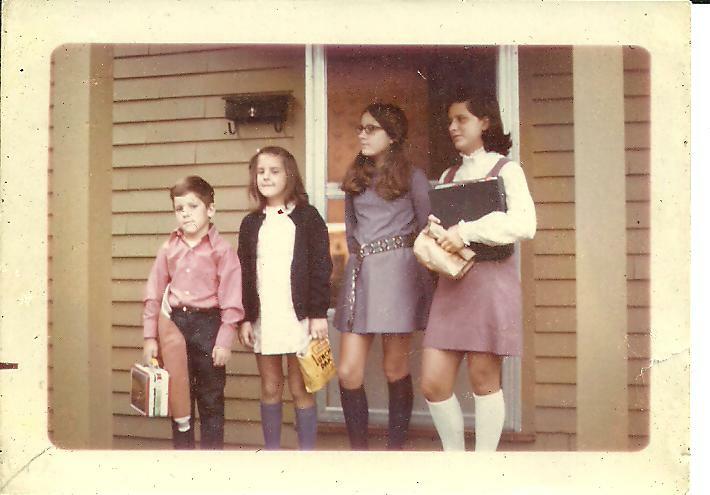 My first day of school was MANY years ago – but I still remember it. We had recently moved to Nashua, New Hampshire, and I really didn’t know much about our new home. I was 5 years old and entered into St. Joseph’s Catholic School. I remember the nun saying I was too young to be in first grade. She was mean – or at least I remember “mean.” It was a huge class of 40 or more students. The nun had no trouble maintaining order. I remember other students getting a pointer across the hands! I was too afraid to say ANYTHING. I got on the wrong bus that first day of school and was still on the bus when the bus driver pulled into the station. I didn’t know when to get off the bus. Nothing looked familiar to me. When they asked me where I lived, all I remembered was that we lived near a cemetery. There are a lot of cemeteries in Nashua! that day, I had to wear a sign “Debbie La Valley Bus #9” until I remembered the correct bus and where I lived. At lunch, we would walk to the nearby high school for lunch. I refused to eat. This made the nuns even meaner because they would yell at me for not eating. My mother ended up paying a mother of one of the students to feed me lunch. Kids that lived close by could go home for lunch. I remember having Spaghettios either all the time or most of the time. I would also watch The Real McCoys and I Love Lucy while eating lunch. I ended up enjoying school – especially its social aspect. I even went on to college and got a BA in English. I know that the little shy 5 year old version of myself would have never thought I would have voluntarily signed up for more school. I have many great memories of school now. I hope my nieces who are heading back to school in the next week or so – realize these are great times for them. I like all your blogs ! You are really a great writer and I like the way you put things together. The picture of the first day of school is good and I am sure the family enjoys seeing it with your story. Thanks, Uncle! I don’t remember what grade I was in – but I know Ken was only about 3 or 4 years old. This shot may have been used in the local paper. We look like the Brady Bunch kids! I love the knee socks – very groovy!